Raaga.com: SS Rajamouli’s Magnum Opus BAAHUBALI enters Guinness Book of World Records! SS Rajamouli’s Magnum Opus BAAHUBALI enters Guinness Book of World Records! SS Rajamouli’s magnum opus, BAAHUBALI, staring South sensations stars Prabhas, Tamannaah, Rana Daggubati and Anushka Shetty has made its first major landmark! The film’s mammoth and gigantic poster has entered the Guinness Book of World Records and earned the rare distinction of being the world’s largest poster. The previous record in this category was a poster of 50687.25 sq ft surface area and Baahubali has challenged this record with a poster of 51961.32 sq ft surface area. The event was organized by Global United Media who are the Kerala distributors for the film. Briefing media Executive Producer of Global United Media, Mr.Vivek Thomas, said, "I am glad that we were able to successfully complete this task amidst the thunderstorm and wagging monsoon in Kerala. We would be releasing the making video of this LARGEST POSTER soon, may be by 4th of July". According to reports the poster was unveiled at Kochi on Monday amidst popular celebrities of Malayalam industry, BAAHUBALI cast and crew. 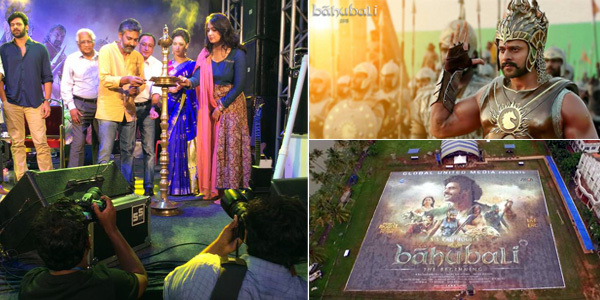 The epic poster was unveiled at the audio launch of Malaylam version of BAHUBALI. The poster was inspected by Guinness Book of World Records officials though the officials have yet to confer the title but the organizers are hopeful that the poster is sure to enter into the records. The magnum opus has already been declared as India’s most expensive film and has generated positive response from viewers. The Telugu version of its trailer created a record when it amassed 4 million views within two weeks of its launch on Youtube and now the Guinness Book of World Records. Film buffs are going crazy to watch the epic and hope as per its publicity the film lives up to its expectation!